Police officer James Givens has been working for more than 26 years at the Cincinnati Police Department but has never experienced anything like he experienced in a video below. When he was sitting in a police car in a parking lot together with his colleague, he got an unexpected visitor. A goose came up to his car and started pecking on the side of it. Police officer James first gave her a piece of bread, thinking she was asking for food, but she did not pick up the bread from the ground. Goose kept quacked at the police, then stepped a few yards towards the water. Immediately after that, she returned to the police officers and continued to peck the car, so the police officer decided to follow the goose. When they left the vehicle, goose led them to the nearby river. The goose led them 100 yards away to a grassy area near a creek. Sitting there was one of her babies, tangled up in a balloon string. 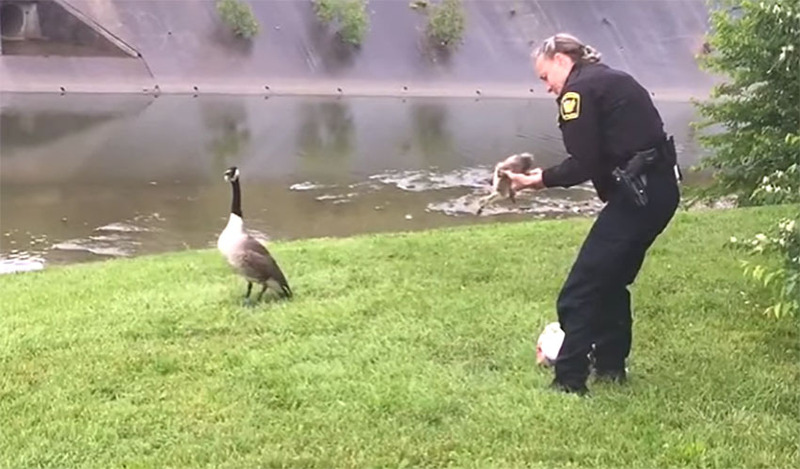 Officer Cecilia Charron began to untangle the baby, and the mother goose just stood there and watched, quacking. She didn't become aggressive, and just let Officer Charron do what she had to do to set the baby free. The mother goose was grateful for their help, and the baby passed the whole rescue campaign without any injuries. Well done to cops for such a wonderful act with helpless animal!